« Time for a new Mac! Check it out around 0:43. I first noticed this weird flickering/flashing of the display brightness when waking the MBP from sleep occasionally. I then noticed it as I returned to the Login Window and started closing the lid (the Apple logo on the lid flashes like crazy also). Eventually I discovered that if I set the Login Window brightness to be different from the desktop brightness (or if the ambient light sensor previously did so) then it reliably flickers. Sometimes it’s just 3 or 4 flickers; sometimes it can go on strobing for about 10 seconds, creating an impressive “disco” effect in my office. At first it didn’t bother me, but it kept happening more and more. Thinking it might be a hardware issue, and because the MBP was still within the 14-day DOA period, I called AppleCare and explained the problem. The tech went through the usual diagnostics, PRAM/SMC resets, etc. He also got me to do an Archive & Install (or, more accurately – since A&I no longer exists – to reinstall Snow Leopard on top of itself). No change. Eventually he gave up and escalated the case to senior tech support (i.e. someone actually at Apple instead of a call centre!). This chap, Sam, was very helpful, and walked through some more diagnostics. He’d never heard of this problem, and nor had any of his colleagues. Eventually he got me to try an Erase & Install, to rule out any possibility of my installed apps or system config causing the flicker. Here’s where it started to get interesting. After an Erase & Install (10.6.3), I didn’t get the flicker (although there were occasionally 1 or 2 slight flickers/flashes as it tried to change the brightness level between the desktop and Login Window). However, after applying all the updates from Software Update, the flickering returned! So it was looking like a software issue of some sort. Magic Trackpad and Multi-Touch Update 1.0… BOOM! (As Mr Jobs would say.) The flicker’s back with a vengeance! 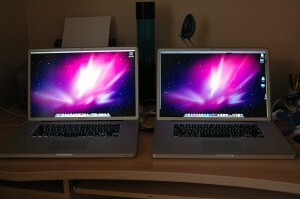 I then repeated the experiment but installed only 10.6.4 and the Magic Trackpad update. (10.6.4 is needed in order to install the trackpad update.) Again, the flicker returned as soon as I installed the Magic Trackpad update. Now, quite why a trackpad update would mess up the display brightness is beyond me – as is why I even need a trackpad update (it appears to do exactly nothing to the trackpad on my MBP). But it would definitely seem to be related to the problem. Now at the end of this rather lengthy process, I noticed something else interesting. Generally the rapid flickers only happen fairly randomly – say, once every 3 or 4 returns to the Login Window. However, I noticed that if I happened to start closing the lid while returning to the Login Window, the flickers happened every time. How could moving the lid affect the flickering? My first thought was the ambient light sensor. This is built into every MBP and it adjusts the display brightness according to the light in the room. However I’d turned this off as part of my testing (System Preferences > Displays > Automatically adjust brightness as ambient light changes), so I had ruled this out. What I eventually realised, though, is that the Login Window overrides this setting! So even if you’ve turned it off for your user account, it turns back on again in the Login Window. And indeed, if I moved my hand over the sensor as the Login Window appeared, the flickering happened every time. It’s almost as if the light sensor algorithm is “fighting” with the algorithm to change to the new Login Window brightness level, causing the rapid flicker. Well I felt I was now getting somewhere, but Sam at Apple was still stumped as to the cause of the problem. After discussing with his colleagues, they decided the best bet was to declare the machine DOA (dead on arrival) and replace it with a new one. This would rule out any problems with the hardware. When I got the new MBP, I noticed out of the box that it did the slight flicker that happened after the Erase & Install on the old MBP. Then I installed 10.6.4 and the Magic Trackpad update and… the rapid flickering/strobing was there. It’s exactly the same as the old MBP! At the moment the ball’s in Apple’s court. I’ve sent them a System Profiler report so they can see my exact setup at the time of the flickering (this is a great Mac OS X feature BTW). Sam has passed the info back to Apple engineering – they’ve managed to reproduce a “similar” problem on their test setups, and are looking into it further. I’ve now reinstalled OS X on the new machine, applied all Software Updates except the Magic Trackpad update (to avoid the flicker), got all my stuff across, sent the old MBP back, and now I’m a happy camper. I felt like I’d wasted a lot of time with this flickering problem. I spent hours and hours diagnosing the problem with Apple, then I had to deal with transferring all my setup twice – first onto the old MBP, then onto the new. That’s a lot of wasted work hours. On the plus side, Apple were generally helpful and understanding throughout the process, I got another machine (albeit also refurb) with an extra month’s warranty and a nicer display, and they also threw in a 7200RPM drive for free by way of compensation (though I had to install it myself!). So now I have the exact machine I wanted in the first place. I can’t complain. Can you reproduce this display flicker problem with your MacBook (Pro)? I’d love to hear from others that have this problem in the comments below. This entry was posted on Friday, October 29th, 2010 at 4:17 pm	and is filed under Hardware. You can follow any responses to this entry through the RSS 2.0 feed. Both comments and pings are currently closed. I’ve had a similar problem with an older MacBook. At one point I called the Help Center, and a staffer stepped me through the PRAM/SMC resets. That seemed to help for a while, but it returned. My wife’s machine (similar hardware to the one you had problems with) also displays this flickering. I assumed it had to do with the fact that she has her resolution set below the max, and I was seeing the flickering when using fast user switching to move between an account I set up for myself (with the resolution maxed out) and her account. But, it does seem that I just started noticing the flickering recently, and I did just recently install the Magic Trackpad update, so maybe our situation is the same as yours — thanks for escalating this at Apple, now I can look forward to a fix from them soon, I’d presume. Thanks for your responses so far! @DonB: Yes, it’s quite random due to the light sensor. If the ambient light in the room is consistent, and you never close the lid or wave your hands around as you switch, then you’d probably never see the flicker. @Rob: Yes, hopefully we’ll see a fix from Apple soon. I’ll update this post when I hear anything. Regarding the Magic Trackpad functionality – I already have inertial scrolling/3-finger-drag without installing that update. Maybe because I have the latest MBP?